In England, Australia, New Zealand and my house Pavlova is a very popular dessert. I am not sure why it’s not only not popular in the US but it’s not even well known. Pavlova is a quick, light, inexpensive, impressive, and utterly delicious dessert. 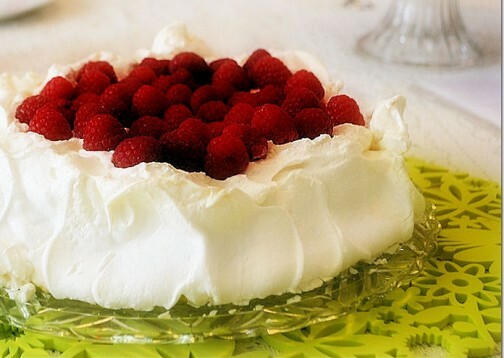 Pavlova is usually served during summer months since fresh berries are an important component. Legend has it that Pavlova was named after the Russian ballet dancer Anna Pavlova sometime in the 1920’s. But there the agreement ends. There is a huge and controversial issue around the country of origin of this dessert. Both Australia and New Zealand claim it. Pavlova is a popular dish and important part of the national cuisine of both countries–as it is England (but England doesn’t claim to be a country of origin). Ok, ok! I can hear you all hollering but, what IS “Pavlova”? Pavlova is a meringue dessert with a crisp outer shell and a soft, light, fluffy center. The meringue crust is topped with lightly sweetened whipped cream and fresh berries–and kiwi– to serve. I make two versions of this dessert. Version #1, and the most traditional is below. In Version #2, I mix a little lemon curd into the whipped cream, and I use blueberries instead of the more traditional raspberries and strawberries. Trader Joe’s carries a very good and inexpensive lemon curd. If you have a lemon tree, you can make your own lemon curd in the microwave with my recipe. Pavlova doesn’t keep! Don’t assemble the Pavlova until JUST before serving, and don’t expect to enjoy they leftovers (they’ll be soggy). Make sure this is eaten all up all at once. The good news is that the meringue base can be made ahead and stored for a few days in an airtight container before assembling and serving, which makes this a great showstopping dessert to make for guests. High humidity might negatively affect this dessert. It’s best not to attempt to make this on a humid, wet, rainy day. Beat the egg whites on high speed until firm, about 1 minute. With the mixer still on high, slowly add the sugar, in slow steady stream or 1 T. at a time and beat until it makes firm, shiny peaks, about 3 minutes. Remove the bowl from the mixer. Mix vanilla, cornstarch and vinegar together then fold that mixture lightly into the egg white mixture using a very clean rubber spatula (there should be no oil, fat, butter, residue on the spatula). Pile the meringue into the middle of the circle on the parchment paper and smooth it within the circle, making a rough disk. Then, make a crater or a bowl in the middle of the flat meringue pile. (So the meringue looks like a rimmed soup bowl or large saucer. This “crater” will hold the whipped cream and fruit at serving time. Bake at 200 degrees for 1 1/2 hours. Turn off the oven, keep the door closed, and allow the meringue to cool completely in the oven, at least 1 hour, overnight is better. (The meringue will deflate if exposed to cold air before it’s cool). Store in an airtight container until ready to serve. Do not refrigerate. Place meringue disk onto a serving plate and JUST BEFORE SERVING spread the top completely with sweetened whipped cream. Spoon the berries and the traditional Kiwi, if you can get it, carefully into the middle of the Pavlova, leaving a border of cream and meringue. Serve immediately. Whip the cream in the bowl of an electric mixer fitted with a whisk attachment (you can also use a hand mixer). When it starts to thicken, add the sugar and vanilla and continue to beat until firm. Don’t overbeat! If using a Kitchen Aid, make 1 ½ or 2 cups cream, any less and the whisk won’t get it all up from the bottom. You’ll love it! Practice this once for the family, and then WOW your guests with it the next time!